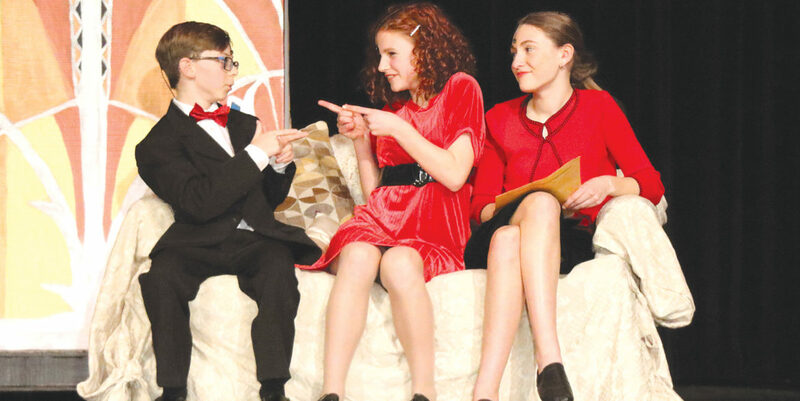 Oliver Warbucks’ secretary Grace Farrell (played by Sarah Kudas), right, beams as “Daddy” Warbucks (Nick Dery) and Annie (Brynna Tinnirella) joke happily about their future life together now that he has decided to adopt the enterprising orphan. Old timers in town will remember Little Orphan Annie from her radio program and her long-running comic strip, and many will remember at least one of her several movies and the popular musical play, Annie, as well as Annie, Jr., the adaptation for a young cast offered to Suffield in 2012 as the first musical play produced by Suffield Middle School. Annie, Jr. came to town again for three performances this year at the end of February and the start of March, and the town was delighted again. As Annie, Brynna Tinnirella showed the spirit and enterprising gumption that characterized cartoon Annie, and made it clear that she was in charge of her life. In the role of “Daddy” Warbucks, the bald, powerful, millionaire who eventually adopted Annie, Nick Dery carried the forceful personality and underlying good heartedness of the tycoon well. In other lead roles, Miss Hannigan, the tyrannical, hypocritical, child-hating matron of Annie’s orphanage, was played to the hilt by Sophie Collins, whose musical voice was among the best. And, in needed balance, “Daddy” Warbucks’ loyal secretary, Grace Farrell (Sara Kudas), was warm to Annie throughout. Matron Hannigan’s brother, “Rooster,” and his girlfriend, Lily, (Georgia Qua and Amelia Krol) provided good comedy. Annie, Jr. at SMS mobilized a great ensemble of singers and dancers. From the opening number in the orphanage to the finale, where the most well-known song was reprised – “Tomorrow” (“It’s only a day away!”) – this was very much a musical musical, with offstage support from the SMS Elite Singers to add quality. And the music continued into the protracted curtain calls with the stage full of the tremendous cast and supporting backstage crew. On Friday night it was music director Laura Noonan who announced and thanked the many supporters and adults who helped make this successful production happen. The Observer adds its thanks to all of you for a great demonstration of what our Suffield youngsters can accomplish.